Originally from Asia, known in China as ‘the exlir of life’, Kombucha is fermented, sweetened tea. The Kombucha SCOBY is a gelanitous layer of cellulose which grows on the surface of the sweetened tea. It is composed of different yeasts and acetobacter. The yeasts convert the sugars into ethanol and the acetobacter convert the ethanol into acetic acid. There are smaller amounts of several other bacteria strains within the SCOBY, including lactobacilli. As well as sugar, tea is essential for the growth of the SCOBY. It is thought that at least 75% of the caffeine is consumed during the fermentation. The jar can now be placed somewhere warm to ferment. This needs to be between 20 and 30 degrees Celsius, ideally between 24 and 28 degrees Celsius. A Kombucha will take anywhere between 7 to 14 days approximately. When to stop the fermentation (by decanting the liquid and bottling) is to some extent down to personal taste. Generally it is ready when most of the sweetness is gone and there is a slight but pleasant sourness. The longer it is left to ferment the more sour it will become. Alone we rot, together we ferment!! Alone we Rot, Together we Ferment is the slogan of Iggy’s Live and Cultured – an inspirational brewhouse and fermented foods enterprise in the Salish Sea. These are some words for a brewing revival culture. A forest tribe called the Baka have this as their maxim: “The world is abundant with plenty for everyone, scarcity is caused by people who have forgotten how to share”. It is from this place we brew. For to brew is an ancient process, not restricted to the brewing of beer. To brew is to harvest and infuse, to steep and to simmer, to decoct and to blend. It is the art form extracting the power of plants in water, and the production of drink that we can consume, for our bodies and for our enjoyment. When brewing is practiced, the realisation of plenty creates stronger social relationships. When there is loads to go round, loads goes round. And when there is loads to go round new circles are created. New circles create new collaborations. Friendships gain currency and scarcity and waste are reduced when people build capacity to grow and produce together. Abundance is created when people take brewing and gardening back into their hands. Alone we Rot, Together we Ferment. Like Apples scattered about the earth, we can either be consumed by the forces of nature or pull ourselves together and make nutritious foods and drinks, (precious juice, cyder and vinegar)! The human body contains approximately 37 trillion human cells – a huge but tiny number compared to the number of bacterial cells we co-exist with – coming in over the hundreds of trillions. These bacterial cells that make up so much of our bodies are known as our microbiota or micro biome. A healthy microbiota helps our bodies: digest food, produce vitamins and essential amino acids, influence fats and glucose metabolism, help maintain normal body weight, regulate energy levels , reduce inflammation, neutralise carcinogens and build a healthier immune system. Its now thought that the microbiota might even effect our behaviour and cognitive functions such as learning and memory. As within so without. In studies of bacterial life both in the human body and in our agricultural soils theres been observation that greater microbial diversity results in increased stability, nutrient cycling, disease resistance and resilience. "Bacteria keep both our human bodies and our Earth's body alive and continuous." – Pheobe Tickell, Microbial Sceintist (These two sentences are quotes by the co-founder of the Future Farm Lab project). In the age of Industrial food, where bacteria are nuked out of existence to give many of the products we buy as food shelf life, and when our most popular food and drinks are crammed with sugar water or pasteurised for higher profit margins, and when we are all consuming largely dead foods.. brewing can make us more alive. To brew is to be connected to the seasons and to a wider web relationships. To make the most of the earth’s fruits that are produced in abundance by the power of sun, rain and insects alone, each year. It is to expand your sense of self, what you identify with, to the whole of life. Fermentation and gardening can give us a better relationship with our own bodies, with the people around us, with the soil and water that feeds us and with plants that can surround and nourish us. The culture of Remembering How to Brew. It is this culture that we will share freely, as it is only through the sharing of knowledge that our culture will evolve. As our brewing and gardening histories are so rich, this evolution is to remember: to remember how to be gardeners – how to forage, harvest, prepare and ferment – the abundance of our living landscapes. We do not need to rewrite cultural history as much as to revive and share it. We need to open-source this culture, because the faster it spreads the faster it can heal the damage being caused. We need resource sharing networks of small-scale producers for all forms of resilience. When our biosphere is dying, and we depend on its health for ours, we need to displace the destructive culture for one that can help it self heal. This culture starts with reclaiming our food and drink systems by growing and producing locally for as many of our primary needs as possible. Every human being on Earth deserves the means to access healthy food and drink, as every organism deserves an uncontaminated environment to feed from. As our stomachs share bacteria with soil, we can feed ourselves in the future. As the branches of an Oak tree are in an Acorn, we can can create a culture that sustains life. From this place, we invite the world to brew. Join our mailing list or follow our blog for the launch of our brewing and plant drink revival WIKI in 2017. We are very grateful to Charlotte Petz for such a brilliant interview and review of Old Tree! 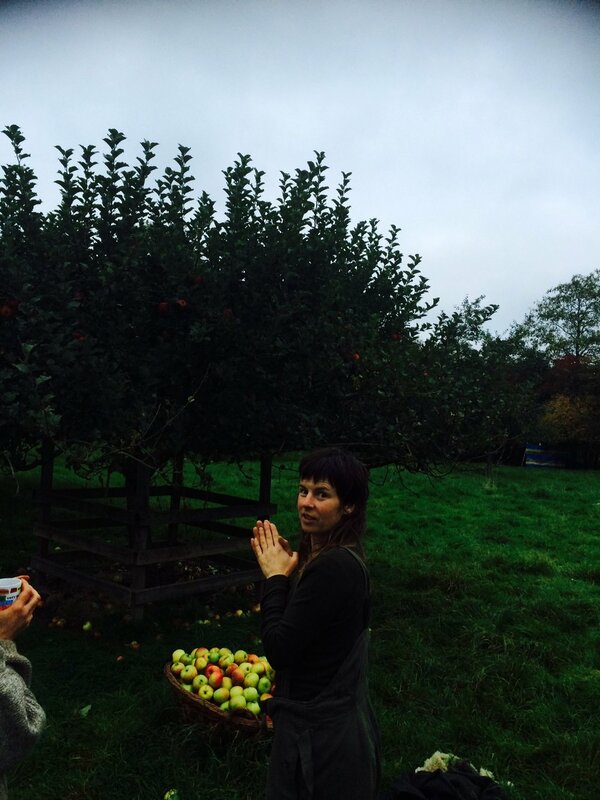 Old Tree's first harvest festival – 2 day mass Apple Scrump in an abundant Somerset orchard. 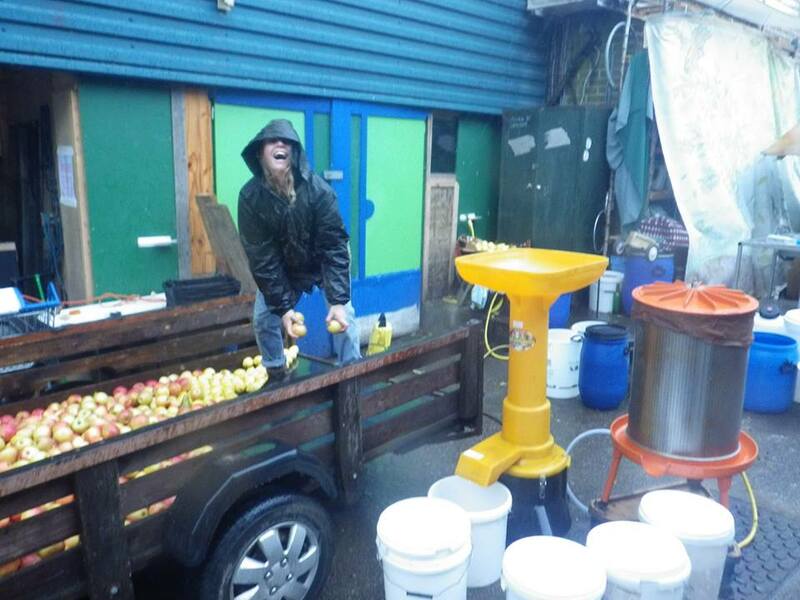 We juiced nearly 2000 litres in two days and still couldn't get all the Apples! We have a massive resource of unharvested Apples in this country and a rich orchard (cultural and genetic) heritage, which we are planning to revive through events like this. Please spread the word and checkout the slide show from this years event below. RECIPE for the Hedgerow drink of summer time! Add the citric acid, get the temperature over 72 degrees celsius. Crash cool the containers in the fridge to preserve shelf life. 1 litre makes makes 25 drinks…. "Over consumption results from our fear of scarcity"
This article sumarizes the ideas put forward by Jeremy Rifkin in his book Zero Marginal Cost Society. He argues that the emergence of the collaborative commons we see exemplified by the internet is paving the way for the end of market capitalism towards a new economic system defined by sharing energy and information. "The creation of a collaborative commons" is a big idea, that we are planning to explore with our botanical drinks fro edible landscapes. We want to feed the D.I.Y culture with all our knowledge of plants and fermentation and invite everyone to share theirs... This cumulative effect of this could be to kickstart more local production processes and sow the seeds of abundant landscapes that reduce over-consumption and production inherent in our present system. Its a "collaboratively edited encyclopedia for plant drink revival"
We will be sending out our first seasonal newsletter when its done. The Elderflower's moved quickly this year.. But Meadow Sweet has come out and can be used with the same recipe! Its another beacon of white flower in wild British landscapes. This one usually found growing near water.. Smells as sweet as it sounds and brews well. E.F Schumacher wrote Small is Beautiful before any of us were born, and this little book fell of our book shelf and onto our desk recently. Its a brilliantly written manifesto for 'economics as if people and planet mattered'... The same idea that is the very slogan of think-tank NEF - The New Economics Foundation today. This bit had to be blogged as it encapsulates our vision for Old Tree growth. “Our most important task is to get off our present collision course. And who is there to tackle such a task? I think everyone of us, whether old or young, powerful or powerless, rich or poor, influential or un-influential. All small medium enterprise (SME) owners, know how challenging it is to manifest a small business that can pay the required living wage and still make profit in today's economic climate. What is evident is that the small must survive for our fundamental wellbeing and resilience. In the realm of smaller and slower are the answers to our most prescient social, environmental and (longterm) economic crises. Its important to remember that the gigantic can only survive with the availability of cheap fossil fuels. Cheap fossil fuels do the dirty work of industrial agriculture and modern civilisation. The days of cheap fossil fuels are nearly over, whether they last 10 or 100 years more is conjecture, we need to stop burning them anyway to stand a chance of surviving climate change. For sustainable human existence to become possible we need an alternative economy and mode of production that mimics nature. It has to be local, it has to be regenerative to the earth, it has to properly benefit the people that drive it, it has to be small. To summarise Schumacher we have to focus on 3 things to create the conditions for the small to be viable again in these times. OLD TREE are committed to these ends and are calling out to all producers and SME's for the collaboration and networking and peer-support that can help the create the conditions for these key stepping stones towards a sane: economy, ecology and society in these times. It all started with the mass creation of Elderflower Champagne on a re-occupied industrial estate in Lewes. We picked the season's Elderflowers that grew all the way from Brighton to Lewes and made Elderflower champagne. 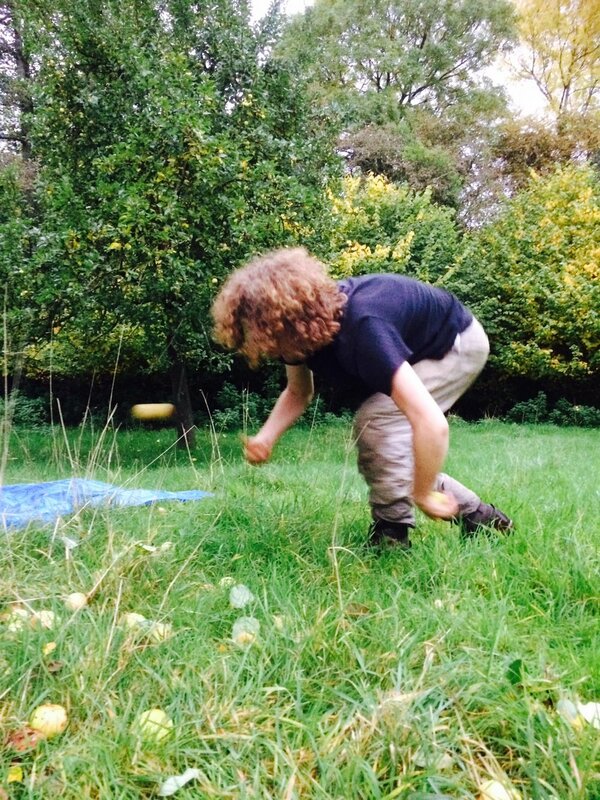 It was an idea that arose from the need to fundraise for a creative project in the Green Futures field at Glastonbury, all made possible by the nature of the space we had access to in Lewes. It was an outdoor space with lots of shelter in the under-storey of the building with an outside tap and Elderflower trees growing out of the walls! There was a recycling centre over the road with an abundance of drink containers we could have for free and a food factory nearby that discarded these big food-grade polythene barrels. We decided to start producing "Elderflower champagne", bottle it, take it to Glastonbury and have it as an offering by donation to help us pull off this project. It worked!!! We've produced more every year since then, perfected the recipe and named the drink "Ebulis', which comes from Sambucas Ebulis - the name of the European Elder and means 'bubbling over with excitement' - the root of the word 'ebullient' in English. Its a naturally carbonated celebration drink that has an excellent effect of stimulating merriment between people! Around the same time the volunteer management of a local woodland was an ongoing pursuit. We had been organising trips to a remote wood in Nutley, calling it the Acorn Project for the previous two years. It was through these woodland trips and building a log cabin in the heart of this incredible Oak wood that Nick and I became full-time collaborators when the brewery idea suddenly became real just months after this. We got a call from a friend who was a baker. He was excited about the new job he'd just got at a zero-waste restaurant that had just landed in Brighton, called Silo. We liked the sound of it and jumped at the opportunity to supply some Nettle Beer we'd been fermenting, along with our increasingly popular Elderflower cider drink-to one of their pre-opening events. We brought our drinks in in all the re-usable containers we had. They loved it, we immediately became friends with all the staff, and the following week we were invited to make all their drinks. We sourced as much as we could from our drinks-making friends locally - Brighton Permaculture Trust, Bartleby's Beer Co-operative, before we could make our own. Within two weeks Silo was open and we had a big chalk drink specials board that looked like this! We set about our new lives as professional drinks makers. We used a contact we had made with a fruit and veg grocer we met at a car-boot sale to acquire surplus fruit. We managed to get loads of second class/surplus lemons from him straight away. One of our first triumphs was Pink Lemonade - we were Pressing windfall apples for cider production shortly after Silo had opened in October and we also had some big fresh beetroots from a vegetable garden, so we decided to stick them in the press to make Raw Apple and Beetroot Juice that could go straight on the specials board... Then we came to pulp and juice the Lemons, and we thought, hold on a sec, what happens if we don't hose down the deep purpleness from all this apple pulp before we press these lemons through it? Bright Pink lemon juice happened! Our Pink lemonade cordial was born. We then made our first beer in the restaurant, we discovered the wonders of fermented soft drink cultures, then we invented Nettle Ice Tea! Medlar drink, Raspberry and Redcurrant cordial, Ebulis – Elderflower Bubbly, Nettle Beer, Gruit Ale, Organic Apple, Pear and other fruit cyders monthly, Raw fruit and veg juices of all flavours fortnightly, Green Tea Kombucha weekly, Fruit water Kefir, Rosehip & apple cordial, Birch-sap nectar of the trees! Quince lemonade cordial, Chocolate Peppermint Lemonade cordial, Lime and Ginger Cordial, Ginger Beer made with a natural Ginger Bug, Oxymel - the words oldest cordial, Cyder vinegar, Mead, Hedgerow wine, Herbal wines, Rhubarb Soda, Beet Kvass and real Ale. Creating these drinks are what several of us now do full-time for a living. We are botanical brewers and we produce small-batch, hand-made drinks for restaurants, events, as well as selling direct to all who want it and are within the reach of our production network. We are on a mission to revive hands-on brewing culture worldwide and bring people back into beneficial relationship with the kingdom of plants that offers so many solutions to our (individual and planetary) health problems. This is how we started. Eternal gratitude to the master-chef Douglas McMaster for creating the conditions for us to emerge and raising our profile with the genius cuisine, reputation and restaurant-on-a-mission that is Silo . Next up – Silo to Preston Barracks, the botanical garden brewery of Brighton! "The Old Trees" - a poem (about us!?) found by a friend, thank you to an anonymous author for these beautiful words. Go where you can feel the forest breathing and inhale the understanding beyond words. We climb the banks where the stream has rounded every rock to lapidary softness. We admire every plant for its health, achieved not by some gardener's fertilizer but by the sheer perfection of being in ideal surroundings. We can't help but notice the old trees. They are large, their branches twisting and spreading to catch the light perfectly, their canopies spreading to the sun and their roots firm in the trees' own shade. The trees are silent and undeniably present. No other thing in the entire universe can take the place of a tree, and the way that it's rooted is perfectly suited to its location. The legends say that these old trees have consciousness and wisdom. We can learn from that. Behind is the whole of a forested ridge. Where the trunks are bare and the canopy thick, the shadows are as black as night and the silence is overwhelming. The sun is fierce, fiery, burning, but the millions of leaves absorb the blaze and leave only shadow below. They transform violent heat into violent peace. In the forest, the trees may rustle with the breeze, but they make no words. We may see the outlines of the branches on the sky, but they form no image. the flowers may exude sweet scents, but they compound no perfume. The old trees do nothing we would do. They are completely what they are, without the slightest veneer of the human, and yet they are supreme in the forest. This is an inspiring manifesto from The Art of Fermentation – the book that we encourage everyone who wants to get into brewing with us to read as foundational knowledge. The book is "an in depth exploration of essential concepts and processes from around the world". A Cultural Revivalist Manifesto is its epilogue... It captures the spirit with which we can make these changes, step by step, plant by plant and ferment by ferment... We have taken the time to type it out by hand to get a better grasp of it ourselves and because it can only be found as a PDF for free download across the rest of the internet, so get this! "WE MUST RECLAIM OUR FOOD. Food is much more than simply nourishment. It embodies a complex web of relationships. It is a huge part of the context in which we exist. Reclaiming our food means actively involving ourselves in this web. This is where our food comes from, plants and animals (with microbial assistance). We cannot continue to distance ourselves from the sources of our food, relegating it to highly specialised, mostly faraway, mass-production monocultures, cut off from our lives. Historically, by necessity, we related to the plants and animals we ate. We knew them, relied upon them, and through their pursuit and cultivation, we were intimately connected to our environment. We need to become reconnected to the sources of our sustenance. Get to know the plants around you. Grow some herbs or vegetables. Glean and use unharvested fruit. Plant a tree, or care for one, or many. Forage weeds from your yard. If you enjoy eggs, milk, or meat, consider exploring the path of raising chickens or other livestock on a small scale. Find a way to observe and participate in slaughtering and butchering. Respect, honour, and appreciate the life that goes into our food. We have coevolved with these other beings, and our fates are intertwined. Buy local food! Support local agriculture! Get to know farmers, and buy directly from them. Agricultural revitalisation is real economic stimulus and real economic security. Beyond the raw products of agriculture, most people enjoy foods and beverages that have been processed, whether its cheese, salami, or tempeh. Many of these "value-added" processes involve fermentation. Support small–scale local processing and production. It means fresher food, local jobs, decentralisation, and greater resilience in the face of change. Local Production includes not only commercial manufacturers but small informal production, shared through alternative economies such as gift exchange, barter, voluntary donations, herd-shares, community supported models, or illicit underground sales. Find a niche you can fill in the emergent web of food creators. Our ancestors paid much more attention to their ancestors than people in our time typically do. We have our god, and canonise various historical or mythological hero's into icons, but in our time we have very little appreciation for the general continuous lineage itself. However mixed our heritage may be, we are, each of us, the spawn of ancient lineages, which have bestowed upon us incredible cultural legacies. We must remember, rediscover, and reclaim our ancestors, however we can, and honour, protect, and perpetuate their gifts, including tangible ones such as seeds and fermentation processes. Cultural revival is necessary in order to maintain their greatest legacy to us. Keeping it alive is the ultimate in ancestor worship. Mysteries endure. Despite all the impressive advances in microscopic imaging, genetic analysis, and other forms of scientific investigation, the realm of the microscopic is still very little understood. For that matter, so is much about our own bodies and minds. Let us honour the mysteries and revel in the fact that we will never understand everything. Relationships with community. Self-sufficiency is a dangerous myth. We need each other. Love your circle, cultivate it and enlarge it. Share food you grow or make with your community, and encourage others in their food production activities. Community is never perfect and takes hard work, because people have such varied visions, ideas and values. But do the hard work of finding common ground, and build community with the people around you. Our growing awareness as individuals, creating change in our own lives, and communities can (and must) build into galvanising social movements. While reviving local food systems we can also address inequitable access to resources by becoming part of existing movements for food justice and food sovereignty. While making use of indigenous wisdom in our cultural revival efforts, we can also acknowledge and act in solidarity with indigenous peoples struggling for survival. While trying to limit our own carbon footprints and environmental impact, we can also join social movements demanding the same of corporations and government policies. Personal actions can be powerful, but nothing like the force of collective action. We must strive to maximise the use of whatever is abundant, easy, low impact and re-useable. We do not need infinitely more special equipment and gadgetry, we must interrupt the disposable society. Where feasible, scavenge materials to re-use them; process fibres from plants or animals; build a house from earthen materials. D.I.Y Culture! These are but a few strands of a densely interwoven web of relationships that can sustain and enrich us. Fermentation is one way in which we may consciously cultivate this web. This is the daily practice of cultural revival. By engaging life forces, we rediscover and reconnect with our context. We are incredibly excited soon to be stocking Pear Tree Well Water - the only mineral water bottled at source in Sussex. This water has at least 16 natural minerals and trace elements, zero Nitrates and a balanced ph. Its bottled by friends of ours near Uckfield and comes from a 120ft deep underground river beneath 5 ft of solid rock. It was discovered with the help of real dreams from a deep puddle, where an old Pear Tree used to stand. We are hoping to create synergy between Old Tree and Pear Tree by collaborating in both drink supply and re-fill culture. Watch this space and if you live in Sussex, think about getting Pear Tree Well water today. 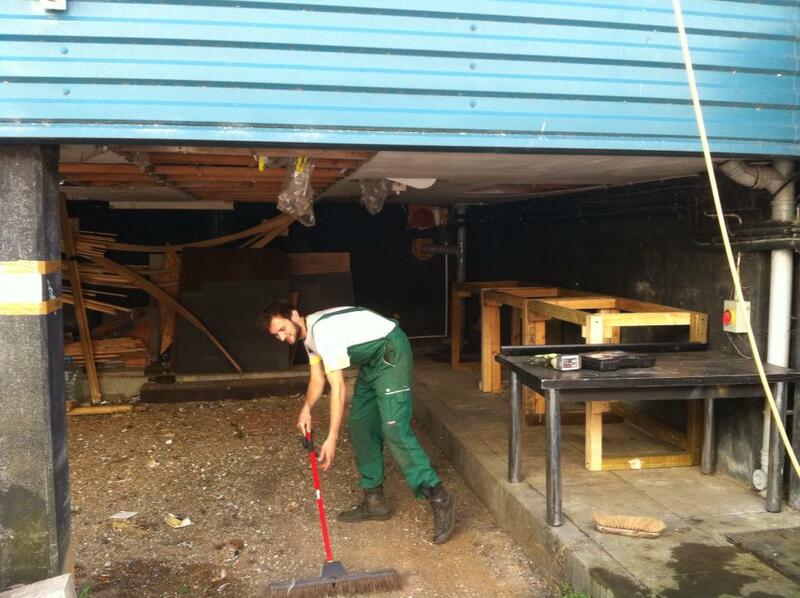 You can bring the containers back to our Botanical brewhouse for-return and re-fill/exchange!